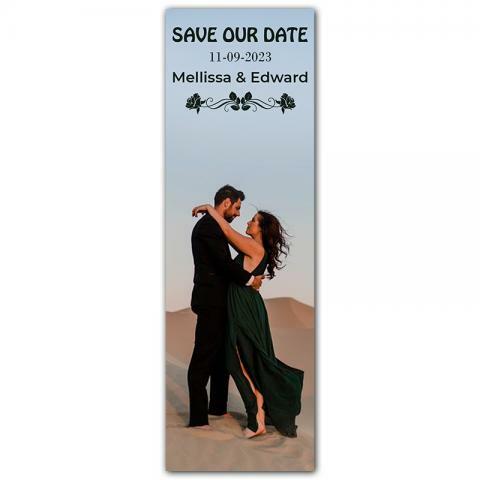 2.25x7 inch Save the Date Full Color Square Corner Magnets - Have you ever thought of announcing a big day against the backdrop of nostalgic moments? Confused?! No, we mean to say that it is pretty simple to make such announcements utilizing the 2.25x7 inch wedding save the date magnets. You can imprint it with the nostalgia spitting images and customize it with some special fonts to make it look more adorable. This specialized save the date magnet is designed and developed like a photo strip, which allows you to announce the big day in a special way! Product Size: 2.25 in. x 7 in.